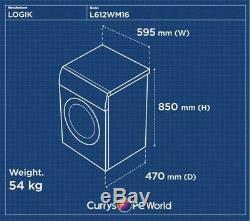 LOGIK L612WM16 Washing Machine - White - Currys. Kitchen Appliances > Laundry > Washing machines. Brand new & pristine product. 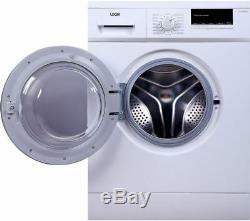 Complete your laundry easily and efficiently with the Logik L612WM16 Washing Machine. A quick wash can be completed in just 15 minutes, making it ideal for smaller loads. Easy and flexible washing Boasting a variable spin speed with a maximum of 1200 rpm, the washing machine also features a range of washing cycles and functions so that you can find the ideal setting for each load of laundry. With dial and button controls and an LED screen, it is easy to pick and choose which program you wish to run. 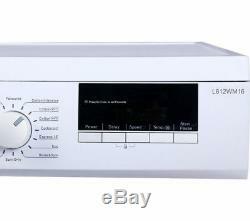 A delay timer allows you to control when the L612WM16 begins the program, making it easier to complete your laundry loads and fit them around your busy life. 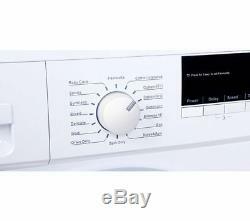 Take control of your laundry with the Logik L612WM16 Washing Machine. All Currys/PC World Outlet guarantees are non-transferable. Quick wash time: 15 minutes. Annual energy consumption: 194 kWh. Annual water consumption: 9240 litres. Consumption per cycle: 1.01 kWh, 48 litres. Maximum spin speed: 1200 rpm. Noise level (wash): 58 dB(A). Noise level (spin): 76 dB(A). Wash programs: Baby Care, Cotton 20, Cotton 40, Cotton 60, Cotton Intensive, Delicate, Drain Only, Eco, Express 15, Mixed, Rinse & Spin, Spin Only, Sports, Synthetic, Wool. 60Â° wash time: 209 minutes. 40Â° wash time: 193 minutes. Quick wash time: 15 minutes for 2 kg. Water remaining after spin: 55%. Program selector: Dial & buttons. Delay timer: Yes, 24 hours. Box contents: Logik L612WM16 Washing Machine, Water supply hose, Drain hose holder, Instruction manual, Transport bolt covers. Dimensions: 850 x 595 x 470 mm (H x W x D), 33.5 x 23.5 x 18.5 inches (H x W x D). Recess dimensions: 860 x 605 x 495 mm (H x W x D). Boxed dimensions: 885 x 650 x 555 mm (H x W x D). This product has no reviews yet, however see what our buyers say about our other products.. We deliver within the UK only, this excludes the Republic of Ireland, the Scottish Highlands, Okrney and the Channel Islands. Warehouse/store pick-ups are not available. All days & time slots are subject to availability. We can install your new appliance on the day we deliver, for most of the UK. Recycling is NOT available for NEW OTHER, REFURBISHED or USED Big Box Appliances & Electricals. Just get in touch and one of our friendly, dedicated team will be happy to assist. We'll reply within 24hours (Mon-Fri, 9-5, excluding Bank Holidays) and do our best to help! Collections direct from our warehouse are not available. Christmas, Easter & Bank Holiday deliveries. Following The Consumer Contracts (Information, Cancellation and Additional Charges) Regulations, we will accept items back even if you have opened the goods to inspect them. Whilst the goods are in your possession you must take reasonable care of them. In an as new condition - in the same condition as supplied to you - complete with any accessories and free gifts offered with it. In all cases we reserve the right to inspect the product and verify the fault. 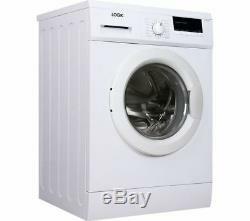 The item "LOGIK L612WM16 Washing Machine White Currys" is in sale since Wednesday, May 17, 2017. 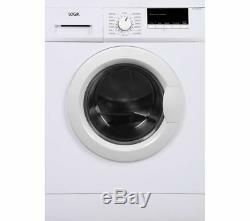 This item is in the category "Home, Furniture & DIY\Appliances\Washing Machines & Dryers\Washing Machines". The seller is "currys_pcworld" and is located in Newark. This item can be shipped to United Kingdom.